In my last blog, I wrote about how Juneteenth became a national celebration of the end of slavery in the United States. 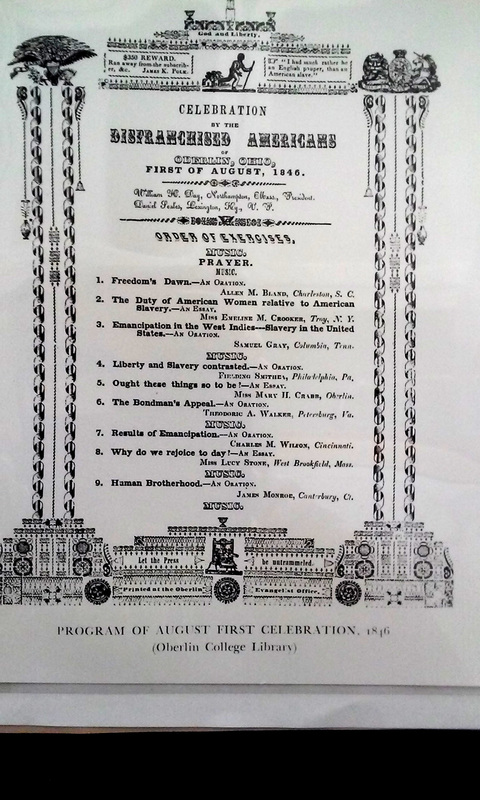 But before there was a Juneteenth, there was the First of August, to celebrate the end of slavery in the British West Indies. 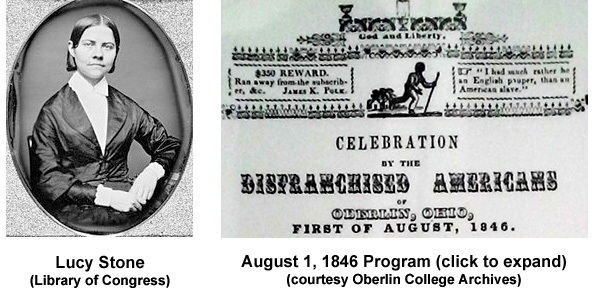 While it may not sound like a big deal to us today, West Indian Emancipation Day, as it was called, was a big deal in early Oberlin and other abolitionist and African American communities. In an era when American slaveholders were tightening the chains ever tighter on their bondsmen, West Indian Emancipation (which would soon lead to the extinction of legalized slavery throughout the British Empire) was a glimmer of hope just 600 miles from the American mainland. But whereas a bloody slave rebellion had helped lead to the emancipation of slaves in the British Empire, a similar rebellion in the United States at about the same time had exactly the opposite effect. Nat Turner’s rebellion in Virginia in August, 1831 caused slaveholders to tighten the chains (figuratively speaking) on their slaves all the more. Discouraged by the turn of events at home, American abolitionists and blacks looked to Britain as a sign of hope. Perhaps there has never been more interest felt, on any public occasion in this place, than at the celebration by the colored people, on the first [of this month]. The anniversary of the emancipation of 800,000 persons held in slavery in the British West Indies, must be a more interesting time to the friends of human rights, than the anniversary of American Independence, so long as the principles of the declaration of that independence are so utterly disregarded by our slave-holding and pro-slavery citizens. And then this was probably the first effort made by any portion of the colored people of Ohio to show their improvement and the effect of giving them equal rights. The idea of the celebration originated with, and all the arrangements were made and executed by the colored people, with scarcely a suggestion from others. And, no doubt, we speak the feelings of the very large audience in attendance, when we say that the whole was conceived and executed with excellent judgment, and good taste. We heard no expression but that of satisfaction and gratification. I love my country, but never can I sacrifice the rights of man for a love of country. The truth must be told: our country is guilty – we are guilty, and slavery must be abolished soon, or we may prepare to suffer the consequences. We have long enough clung to the faint hope of a change; we have long enough listened to the frequest whisper, “Peace, be still”, and now the call is for action. From the memorable rock of Plymouth, a beacon has been lighted by the fires of liberty. The irrevocable decree has gone forth from the Supreme Court of the universe – “Proclaim liberty to all the inhabitants thereof.” If such were the sentiments of the pilgrim fathers, if such be the command of God, liberty we can, and liberty we must have. If “coming events cast their shadows before”, who can prophesy that the decks of the Amistad and Creole are not the faint sketches of our future history. If a Cinque or a Washington shall hereafter rise, (which may God forbid) – if our land shall be deluged in blood – if your attention shall be directed to the Southern quarter by the roar of the booming cannon, and the shrieks of the wounded and dying – if devastation and ruin take the place of supposed peace – or if with the burning of villages they shall be enveloped in one common grave – you will be responsible. You have it in your power to avert it. The same means used for the abolition of Slavery in the West Indies, will avail now. Their efforts were few and feeble, but at last they conquered; and with the same well-directed efforts, with the same spirit, and with the dependence on the same God, we shall conquer. The doom of slavery everywhere is sealed in the public sentiment which caused England to reach out her hand over the broad Atlantic, to lift up from his deep degradation, and make conscious of his manhood, the bondman pining there. The influence of that event will be wide as the world, and longer than the stream of time. Eight weeks later President Lincoln would unveil to the nation his Preliminary Emancipation Proclamation. Last week the New York Times published a blog posted by Jon Grinspan that asked the question, “was abolitionism a failure?” The author answered the question with the assertion that “as a pre-Civil War movement, it was a flop.” It probably won’t come as a great surprise to anybody that the Oberlin Heritage Center doesn’t necessarily share that view, but I thought I’d take this opportunity to reply to some of the specific issues raised in that blog, and to let one of Oberlin’s most esteemed historical figures reply to the question in general. The achievements of the American anti -slavery movement since that time have been such as to impart hope and courage to every heart. Of course, I do not refer to the achievements of any separate and distinct organization. I refer to the achievements of that complicated and stupendous organization composed of persons from all parts of this country, whose aim is the abolition of slavery and the enfranchisement of the colored American. What, then, are some of its accomplishments? In the first place, it has brought the subject of slavery itself distinctly and prominently before the public mind. Indeed, in every nook and corner of American society this matter now presents itself, demanding, and in many instances receiving, respectful consideration. There is no gathering of the people, whether political or religious, which is not now forced to give a place in its deliberations to this subject. Like the air we breathe, it is all-pervasive. Through this widespread consideration the effects of slavery upon the slave, the slaveholder, and society generally, have been very thoroughly demonstrated ; and as the people have understood these effects they have loathed and hated their foul cause. Thus the public conscience has been aroused, and a broad and deep and growing interest has been created in behalf of the slave. But far from being lynched, Lincoln was applauded for these words in 1858, and this and similar speeches gained for him the national recognition that would help elect him to the Presidency two years later. 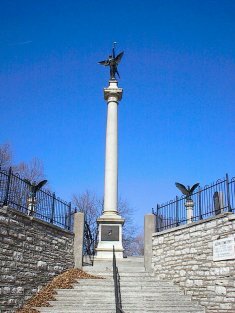 It was the heroic efforts of people like Elijah Lovejoy, John Mercer Langston, William Lloyd Garrison, Lucy Stone, and thousands of other abolitionist teachers, preachers, lecturers, authors, journalists, politicians, Underground Railroad agents, and parents (many of them educated at Oberlin College) that made that possible. As it turns out, it was. The attempt to avoid that reality via secession only served to hasten its demise. Posted in Abolition | Comments Off on Was Abolitionism a Failure? 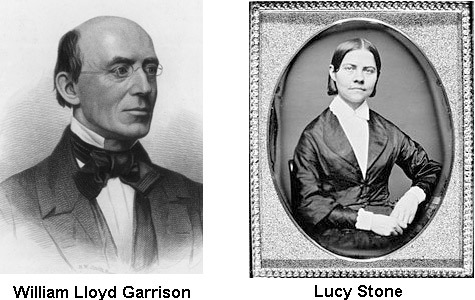 I’ve decided for my next two blog entries to tell the stories of two Southern rebels who had a tremendous impact on pre-Civil War Oberlin. But these weren’t Confederate rebels, they were Southern abolitionists, at a time when “abolitionist” was a dirty word even in the North. They were also students of a theological seminary in Cincinnati – a college that tried to stop them from spreading their anti-slavery message and from doing good deeds among the African-American population of that city. But these students wouldn’t be shut down. Instead they left that school in protest. And they came to Oberlin, along with about two dozen of their anti-slavery brothers, in just the second year of the Oberlin colony, and put this town and college on an entirely new course that its founders couldn’t have envisioned just two years earlier. One of these Southern rebels was the son of a respected Southern slaveholder. The other was a native African who himself had been enslaved. The slaveholder’s son was William T. Allan. 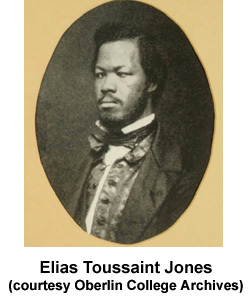 He was born in Tennessee in 1810, and moved with his family to Huntsville, Alabama about a decade later. His father, John Allan, was pastor of Huntsville’s First Presbyterian Church. John Allan owned two families of 15 slaves, who William would later say were “almost as kindly treated as slaves can be, yet they pant for liberty”. But even though he owned slaves, John Allan was opposed to slavery. He was not an abolitionist, but a “colonizationist”, believing in the gradual emancipation of the slaves and their colonization back to Africa. 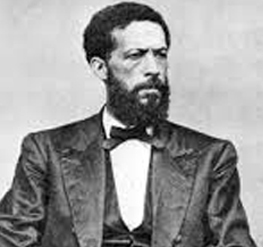 He was a co-founder of Alabama’s Society for the Emancipation of Slavery and the Madison County Colonization Society. For a month in 1832, the Allan family had a houseguest – a young reformer from Connecticut named Theodore Weld. Weld was on a mission from Lewis Tappan, a wealthy New York philanthropist, to travel the country and determine what kind of interest there might be for a new type of college that Lewis and his brother were interested in supporting, called a “manual labor institution”. The idea was that students would engage in manual labor to help pay their way through college, both as a benefit to the college and as moral discipline for themselves. To enhance the moral discipline, the school would teach and emphasize moral values and religious purity. As a secondary goal, Weld was to evaluate existing manual labor institutes that might be worthy of support from the Tappan brothers. 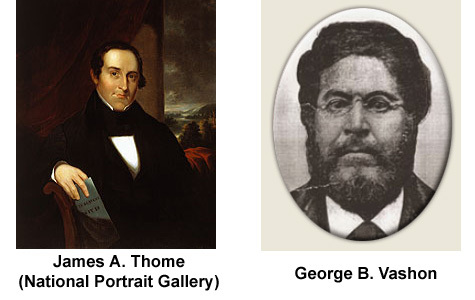 Weld did find such an institute, the Lane Seminary in Cincinnati, and he spoke about it to interested young men who he met in his travels, like William T. Allan (who would become a lifelong friend) and his brother James. Weld, the Allans, and several more of these young men enrolled in the Lane Seminary and arrived there in 1833 to begin their studies. During the course of his nationwide tour, Weld became zealously committed to the abolitionist cause – believing that slavery was a sin and should be abolished immediately, without colonization. Once his original mission was complete, he embarked on a new, personal mission to abolitionize the students of the Lane Seminary. 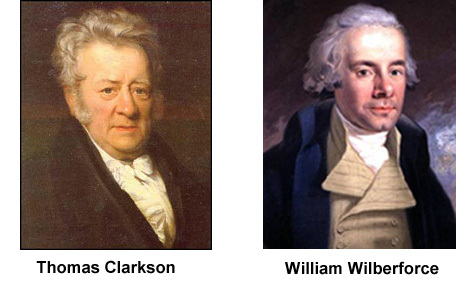 His first target was William Allan. William was a colonizationist, like his father and like most of the Lane recruits. But it didn’t take much effort for Weld to convert him into a full-fledged abolitionist. With that, Allan became an ally of Weld, spreading the abolition message through the Lane student body. Soon they had enough converts that they felt comfortable challenging the colonizationists to a series of debates. The debates would cover 18 evenings, at two and a half hours each. 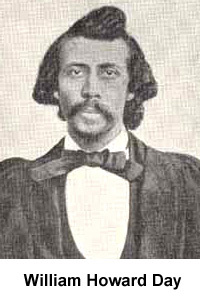 Seventeen students eagerly participated in the debates, many of them recruits who Weld had met during his travels, and most of whom had first-hand experience with slavery in the South, like James A. Thome, the son of a wealthy Kentucky slaveholder, and Huntington Lyman, a Connecticut native who had spent several years in Louisiana. And lest any one should think that in general the slaves are well treated, and these are the exceptions, let me be distinctly understood — Cruelty is the rule, and kindness the exception. One audience member remarked later, “I was rejoiced to hear such a beginning from the son of a slave-holder; for I had longed to learn the true condition of the slave.” Several other students also gave first-hand accounts of slavery, including James Thome and Huntington Lyman. The abolitionism portion of the debates ended on the ninth evening with a vote being taken on the following question: “Ought the people of the slaveholding states to abolish slavery immediately?” The answer was a unanimous Yes (although a few students who hadn’t made up their minds abstained from voting). Most of the Colonizationists who expressed any opinion on the subject, declared their ignorance of the doctrines and measures of the Society until this debate. They cannot find words to express their astonishment that they should have been so duped into the support of this Society, as a scheme of benevolence towards the free blacks, and a remedy for slavery. They now repudiate it with all their hearts. But racism, which was prevalent in Ohio at that time (especially in Cincinnati, situated right across the Ohio River from the slave state of Kentucky), reared its ugly head. The students met with much abuse and condemnation from white residents, and the Lane Seminary itself came under fire from the local community and its supporters, many of whom were slaveholders or conducted business with slaveholders. The school was even threatened with mob violence. The trustees of Lane Seminary asked the students to desist from their activities, but a committee of students, chaired by William Allan, stood firm. Finally the trustees came down hard on the students, banning any further anti-slavery discussion or activities, firing a professor, and recommending expulsion procedures against Weld and William Allan. As a result, several dozen students quit the school in protest, becoming known as the “Lane Rebels”. When news reached Huntsville, Alabama that the Allan boys had left Lane, their father was not happy, and their neighbors were incensed when they learned of their abolitionist activities. Said William, “They blow away against abolitionists down there at a terrible rate – say they’ll cut my throat, that I’m afraid to come home, etc.” However, one of Allan’s Huntsville neighbors, James Birney, a wealthy slaveholder who had co-founded the local emancipation and colonization societies with John Allan, was so moved by the Lane debates that he emancipated all of his slaves and became an outspoken abolitionist. The news of what happened at Lane also sent shockwaves through colleges throughout the North. Many institutions suddenly became aware of student anti-slavery societies on their own campuses and shut them down, in hopes of staving off a similar disaster. One college, however, had the opposite reaction. John J. Shipherd, a member of the Western Reserve Anti-Slavery Society and the co-founder of a newly formed manual labor institution called the Oberlin Collegiate Institute (now Oberlin College), went down to Cincinnati to visit the Lane Rebels and invite them to Oberlin, promising that their philanthropic and anti-slavery activities wouldn’t be squelched there. After a complex set of negotiations (which I’ll describe in more detail in my next blog post), about two dozen of the Rebels agreed to come to Oberlin and enroll in the newly formed Theological Department, headed by the renowned revivalist minister, Charles G. Finney, with generous financial support from the Tappan brothers. William Allan said of the plan, “This Oberlin plan, however, has opened up a new train… That, with me, will be putting on the capstone–I shall have passed the rubicon if I should go to an institution where abolition is concentrated–at the head of which is that arch-heretic Finney.” James Thome and Huntington Lyman joined Allan in heading to Oberlin. Theodore Weld enthusiastically supported the move, but did not join in himself. 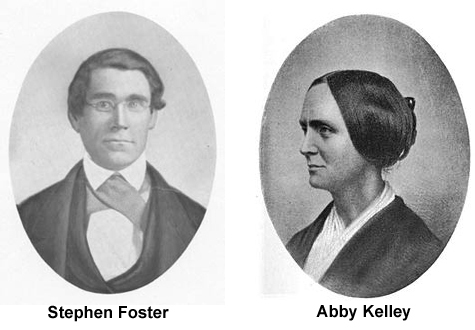 Flushed with his success at abolitionizing first William Allan and then the Lane Seminary, he instead took off on a remarkable speaking campaign across the state that would “fast abolitionize Ohio” and create dozens of new local anti-slavery societies. William Allan graduated from Oberlin college in 1836 and began a long and active anti-slavery career. He preached and lectured against slavery in Ohio, New York, Michigan, Indiana, and Illinois, finally settling in the latter and becoming an agent of the Illinois Anti-Slavery Society. In 1839 Theodore Weld published a testimonial from William Allan in his book about the horrors of slavery. In the 1840s Allan became an organizer of the Illinois and Iowa chapters of the first national anti-slavery political party, the Liberty Party, which nominated his ex-Huntsville neighbor, James Birney, for President of the United States. When William’s mother became mortally ill in 1841, his father advised him not to return home, as local sentiment was so strong against him that he feared for his safety. John Allan himself died in 1843, freeing his slaves in his will. William remained in Illinois and helped free slaves himself, his home becoming a sanctuary on the Underground Railroad. He died in Illinois in 1882 after a long, distinguished and honorable public career.